This beautiful Reserve has a stunning bay, beach, ample grassed areas, picnic tables, benches, swings, a public boat ramp and pier. Ideal for swimming, boating, fishing, jet skiing, kayaking, paddle boarding or simply taking in the stunning views. The unit is also located close to the Acacia Bay shops; a dairy for your convenience and The Bay - Bar and Brasserie. This is a great local restaurant and bar that pride themselves on providing great food, award winning woodfire pizzas, awesome wine and a warm friendly atmosphere. Just 500m up the road is the new and popular Pirate Ship Playground, more swings, petanque court and football field. Our two-storey cutie has just been refurbished and has all you need for a holiday by the lake. A fully equipped modern kitchen looks out to the rear sun drenched patio with BBQ, and new table and chairs. There is an additional BBQ table on the front lawn to enjoy breakfast in the morning sun. The kitchen opens to the dining and lounge with 50” TV and SKY. Also downstairs (off the dining room) is a conservatory with the third bedroom. The conservatory has just been fitted with thermal insulation panels on the roof (sorry you can't see the stars at night now). This bedroom has a quality queen-sized bed and opens onto the patio area. Upstairs is the main bathroom and master bedroom with a very comfortable king-sized bed. There is also a bunkroom with two single bunks (4 beds), all with new inner sprung mattresses. The bunkroom has a 32” TV with Free View and is linked to the downstairs SKY to keep the kids entertained when adults want a bit of time out. The bunkroom has a new ensuite and opens onto a deck with beautiful views of the lake. There is a carport beside the unit to park the car and/or jetski. If you’re bringing along bikes to ride the wonderful tracks and trails in and around Taupo, the private courtyard area is an ideal place to lock these or there's a lockable storage shed in the carport. There are also two kayaks you may use. 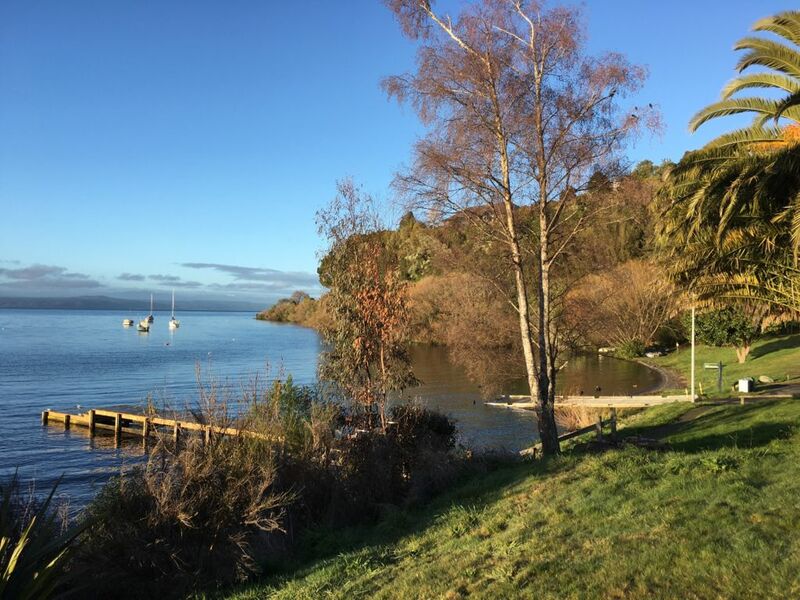 Great Lake Taupo is widely known as the Events Capital of New Zealand, so there’s always something going on … and our Alberta unit is superbly located only 4.5km to town. • No parties or excessive noise - our neighbours are our friends! NOTE: Our property is not suited to those with mobility issues as both bathrooms are upstairs. Extras: Cleaning (Required, NZ$50.00 per stay); Linen (Optional, NZ$10.00 per person). Our property is owned by two families (brother and sister). We have many extended family in the Taupo area and it is always a favourite place for us to visit. We love the outdoors, especially getting onto the lake for swimming, kayaking, wakeboarding, skiing or fishing. Taupo is the events capital of NZ. The small town is always buzzing with excitement. Our favourite event is the World renowned Ironman Triathlon. A grueling 3.8km swim, 180km cycle and 42km marathon run in and around Taupo. Our property is perfectly situated in Acacia Bay, an idyllic lake side community. We love that it's so close, by seems so far away from the Taupo mecca. We also love that we have an amazing boat ramp to launch the boat or jetski just 100m down the road and Te Moenga Bay is simply gorgeous. We are very spoilt! Less than 100m to a Dairy for convenience and The Bay - Bar and Brasserie. This is a very popular bar and restaurant with lots of atmosphere and great food! toilet, shower, Main bathroom is at the top of the stairwell. toilet, shower, This bathroom is attached to the bunkroom. Lake Taupo is a lake in the North Island of New Zealand. It is in the caldera of the Taupo Volcano. With a surface area of 616 square kilometres, it is the largest lake by surface area in New Zealand. The Waikato River is the longest river in NZ, running for 425 kilometres, it rises in the eastern slopes of Mount Ruapehu, joining the Tongariro River system and flows through Lake Taupo. The gorgeous Lake Taupo is just 100m from the apartment. There are views from the upstairs deck and peeps from downstairs. Thanks for letting us book your holiday house. A great property for kids and we loved being just a short walk to the lake. Will look to book again. Fabulous location and a lovely, clean and tidy property with everything you need to have a really enjoyable stay. While there is not a lot of room for children to run around outside, Te Moenga Bay is less than a minutes walk away and there is a great park a short walk up Wakeman Road. Well worth a visit - Jenny the owner was a delight to deal with too. Loved our stay at this property - it exceeded our expectations in many ways, very well equipped, well maintained and clean with an awesome location to local amenities and easy access to the lake. A lake view, sky sports and sunny courtyard out back were the cherries on top! Would definitely stay again and highly recommend to anyone visiting the area and wanting a quieter spot away from the main Taupo centre. Immaculately clean!! Nice and modern and in a great location. Immaculately clean!! Nice and modern and in a great location. Perfect set up with plenty of beds and space. Only minor thing is the curtains let a lot of light in and make the house quite hot in summer. (Not that I am complaining about a hot Taupo summer!). Would definitely recommend this place and We will be back ? ?